Out on CD, vinyl and digital on January 26, 2018. Free poster while stocks last! Ever since “Live In Amsterdam” was released in 2014, both Beth Hart and Joe Bonamassa kept themselves incredibly busy. Beth released 2 albums “Better Than Home” and “Fire On The Floor”, toured Europe and the US countless times, while Joe released a string of live and studio albums, both solo and with Rock Candy Funk Party and Black Country Communion, toured the world many times over, and still had time to hunt for vintage guitars. 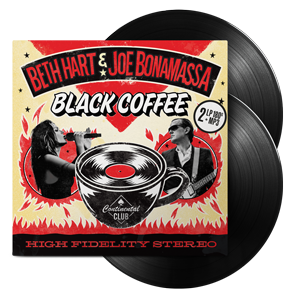 They finally managed to block their busy schedules and record a new studio album, called “Black Coffee”. The album is filled with unique twists on some of their favorite Soul & Blues classics.